One of the most interesting ministries in Texas Conference history has been providing spiritual and social services to seamen coming to our ports. Galveston hosted a vibrant “Seaman’s Bethel” under the direction of Rev. J. E. Reifschneider and with generous subsidies from the Swedish Consul at Galveston. The Seaman’s Bethel provided a library with tracts in many languages, recreation, stationery and postage stamps, and always lots of coffee. One obvious motivation for the center was to provide a wholesome alternative to the brothels, bars, and gambling dens around the port. Improvements to the Port of Houston during the 20th century made it possible for Houston to supersede Galveston and establish itself as one of the most important ports in the world. The Texas Conference recognized the possibilities of an expanded ministry and on June 1, 1971 participated in the opening of a larger Seaman’s Center at the Port of Houston. The Center occupied eight acres within easy walking distance of the moored ships. A swimming pool and lighted soccer field provided recreational opportunities for the visiting seamen. The Seaman’s Center was probably the most ecumenical institutions ever embraced by the Texas Conference. In addition to a full time Methodist Chaplain, there were Roman Catholic, Presbyterian (USA), Presbyterian (US), Missouri Synod Lutheran, Norwegian Lutheran, and Episcopal Church chaplains. One year after its opening, the Methodist Chaplain, Rev. Sam Duree, was able to report a total attendance at the Center of over 34,000 men. That figure was estimated to total about 25% of the men who came to the Port of Houston. Rev. Duree organized field trips for the men to local attractions such as NASA, the Astrodome, and the zoo. He also coordinated Sunday home visits with Methodists who took the seamen to church and then to dinner. Churches continue to provide these ministries. The institution is now known as the Houston International Seafarer’s Center. Remaining delegates at the 14th General Conference of the Methodist Episcopal Church South must have breathed a thankful sigh of relief as Bishop Alpheus Wilson delivered the benediction and adjourned the conference sine die. The Conference convened on May 6 and spent most of its time on the contentions Publishing House reparations question and the election of two bishops, Elijah Hoss and Coke Smith. Texans of the era lived in the hope that one of the new bishops would establish a residence in Texas. It wasn’t going to happen. Coke Smith was the brother of a U. S. Senator from South Carolina. Hoss had been president of Emory and Henry, a professor at Vanderbilt, and editor of the Nashville Christian Advocate. Texas had few charms for men who had been so close to the levers of power. The General Conference created the office of Deaconess, thereby imitating the 1888 action of the MEC. It also appointed a board to consider forming a fire insurance board for the denomination. Delegates began leaving Dallas in droves on Sunday, May 25. On Monday, it took some parliamentary sleight of hand to declare a quorum. As the delegates were becoming nervous about missing transportation arrangements, two unfortunate incidents marred the decorum of the event. Anson West of the North Alabama Conference conducted a lengthy rant against the creation of the Order of Deaconess. Included in the rant was “Departure from Divine order leads to infidelity, anarchy, and ruin.” The speech might have ended the issue. After all, the General Conference action was not going to be rescinded. Pro-deaconess delegates (remember that the delegates are all men.) then moved that West’s rant not be included in the minutes of the General Conference. The conference dragged on while delegates debated that issue. At 1:45 p.m. Bishop Wilson’s gavel came down, delegates began saying their good byes, and a disturbance erupted among the Virginia delegates. Fisticuffs had broken out. Henry Sessler Hoss, the twenty-year old son of the newly elected bishop Elijah Hoss, had been biding his time throughout the Conference. Adjournment meant that he could accost his father’s main rival, in the Publishing House controversy, James Cannon, Jr. Henry Sessler Hoss, a Vanderbilt student demanded an explanation for remarks Cannon had made about his mother in the denominational paper which Cannon edited. Cannon brushed Hoss off, telling him, “Send your father.” Hoss then struck Cannon. –a sorry end for General Conference. Regular readers of this column will remember that James Cannon was elected bishop in 1918. His episcopal service was marred by multiple scandals, and in 1930 when the General Conference came back to Dallas, he had to apologize to the General Conference. (see May 4, 2008 post) Cannon and Hoss did not have to face the awkward situation of serving together as bishops. Hoss retired because of ill health in 1918. Bishop Hoss lived with his son Dr. Henry Sessler Hoss in Muskogee, Oklahoma, until his death in 1919. The younger Hoss had opened a medical practice there. Unfortunately Dr. Hoss outlived his father only three years. As Methodists gather for worship and Sunday School in 2012, they often employ all sorts of visual enhancements. Large scale projection screens, Powerpoint presentations, DVD’s, video clips, and other technologies are so common that they no longer evoke comment. The use of visual technologies to enhance worship and study is nothing new. In the mid-19th century large painted canvas scrolls depicting Biblical scenes were unrolled before audiences. One hundred years ago a popular technology was the stereopticon. Here is a typical church news column from May 13, 1912. Tuesday night a stereopticon lecture will be given for the Sunday School by the Rev. W. Huggett at the Highland Park Methodist Church. At the weekly service at Fort Bliss Sunday night lantern slides of scenes of the Boy Scouts were exhibited. The Rev. W. S. Huggett will deliver the popular lecture, “The Other Wise Man,”in the Trinity Methodist Church tonight for the benefit of the Traveler’s Aid Society. The lecture will be illustrated with stereopticon slides. The stereopticon was a forerunner of the slide projector. Images were painted on glass panels. A light source behind the glass projected the image onto a screen. A typical stereopticon had two lenses so that a dissolve feature could be used. 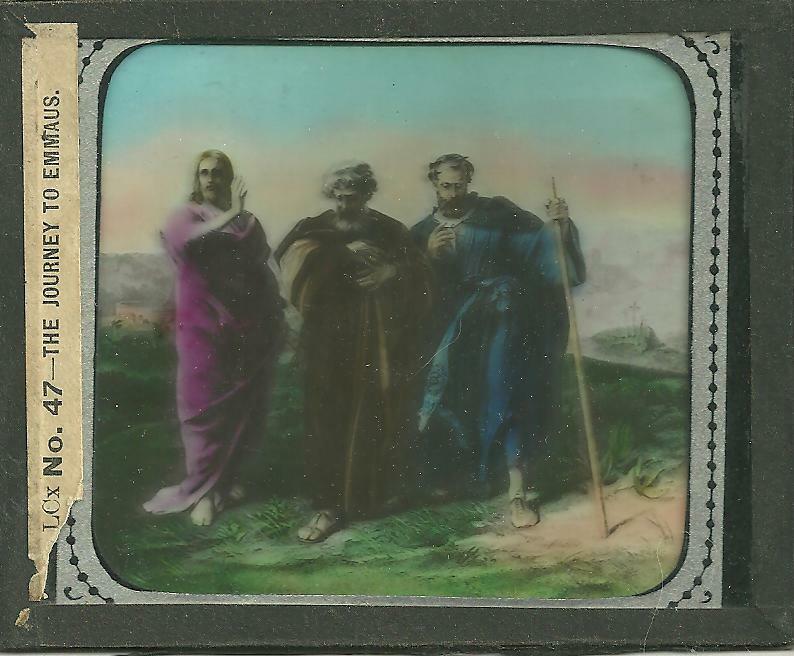 The most popular programs included Biblical scenes, Holy Land travelogues, great masters reproductions, and missionary activities. Stereopticons had existed since the 1850s, and by 1912 they were rapidly being replaced by moving pictures. The attached slide is from the personal collection of Mrs. Bonnie Sandberg. Bishop Henry Clay Morrison hammered the 14th General Conference of the MECS into session on May 6, 1902, in the auditorium on the Fair Grounds in Dallas, Texas. It seems that local organizers had forgotten to secure a gavel so Morrison used a common carpenter’s hammer. The fact that the General Conference was meeting in Dallas was a point of pride not only for Dallas, but also for all of Texas. Although Dallas had been founded in the 1840s, the city’s real growth had occurred in the late 19th century when Dallas became the hub of a regional rail system and parlayed that transportation advantage into becoming the most important commercial and financial center of the region. In 1887 Texas Methodists moved the offices of the Texas Christian Advocate from Galveston to Dallas. It was easy to see how Dallas was a city with a bright future. Little substantive business occurred on the opening day. Governor Joseph D. Sayers welcomed the delegates with a speech in which he shared his childhood memory of attending the 1852 session of the Texas Annual Conference in Bastrop. Sayers was only 11 years old at the time, but related clear memoires of Bishop Paine, Robert Alexander, Homer Thrall, Josiah Whipple and other giants of Texas Methodism. Mayor Ben Cabell followed the governor with his own welcome to the city. (There were three generations of Cabell mayors in Dallas.) George Rankin, pastor of the First MECS Church in Dallas also welcomed the delegates. As the host pastor, his name was being put forward as a candidate for bishop. He would not be elected, but would have influence as the editor of the Advocate. Bishop Charles Betts Galloway responded to the welcome speeches. Then Bishop W. W. Duncan of South Carolina read the Episcopal Address. That address was so lengthy that its reading consumed two hours. One cause for alarm seems strange to modern readers. The address reported that the MECS had grown by only 38,085 members since the last General Conference. That diminished rate of increase rang alarm bells. The rest of the Episcopal Address was routine. It called upon Methodists to support the church mission and educational institutions and pensions for retired preachers, their widows and orphans. The most controversial issue which the delegates would debate seems quite remote from modern concerns. In 1862 Union forces captured Nashville and commandeered the MECS Publishing House. Part of the building was used as a stable for the rest of the war. That left the facilities in shambles. The election of bishops was always an exciting feature at General Conferences. (Since 1939 bishops have been elected at Jurisdictional Conferences.) The bishops recommended the election of two new bishops. Bishop John C. Keener was 83 and was not able to come to Dallas. O. P. Fitzgerald was 73. John Granbery was 83. Bishops of this era presided over multiple conferences, and travel demands were onerous on elderly bishops. The delegates accepted that recommendation, and two bishops were elected in Dallas. More about that in a future post.